If there is one guarantee about your health, it’s that you’re going to get sick. The good news is there are ways to boost your immune system and protect yourself from those nasty colds and coughs that seem to linger for days. Your immune system is your body’s defense against infection and illness. When it’s weak, you have a harder time staying healthy. That’s why it’s important to take steps to improve your immunity. One of the easiest ways to accomplish this is with proper nutrition. By consuming foods that are rich in protein; fiber; amino acids; probiotics; prebiotics; antioxidants; zinc; and vitamins A, C and E, you can help protect yourself against infection and boost your immunity. 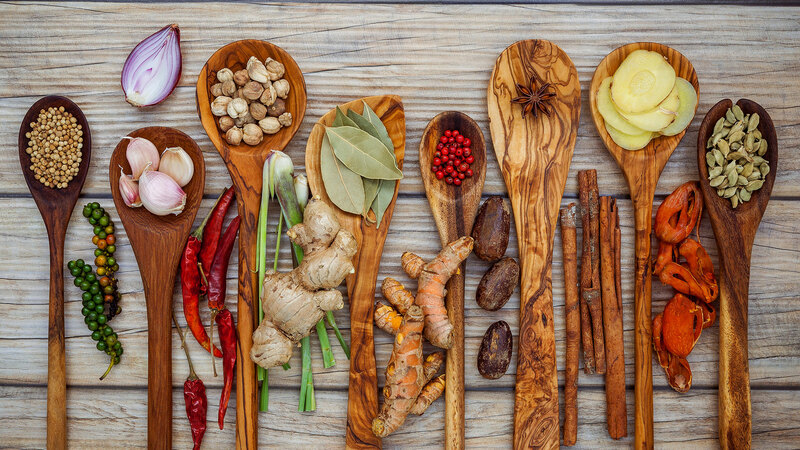 Here are 11 powerful immune system boosters that you can include in your daily diet. Garlic contains allicin which stimulates white blood cells and other immune cells to destroy cold and flu viruses along with viral, fungal and bacterial infections, Michelle Routhenstein, a registered dietitian and the owner of Entirely Nourished, tells SheKnows. She explains that the best way to reap the benefits of allicin is to consume garlic raw since it is released when the raw food is cut, chopped, chewed or crushed. That’s why she recommends mincing it finely in salad dressings or dips such as homemade hummus. Mushrooms contain selenium and the B vitamins riboflavin and niacin, which help boost your immune system. Plus, they taste great in sandwiches, in stir-fries and on pizza. Shiitake, maitake and reishi mushrooms appear to pack the biggest immunity punch; according to a 2015 University of Florida Institute of Food and Agricultural Sciences study, eating shiitake mushroom daily can boost your immunity. Oysters contains more zinc than any other food, Emmie Satrazemis, a registered dietitian and the nutrition director at Trifecta, tells SheKnows. And that’s good news because zinc has been shown to have powerful anti-inflammatory and antioxidant capabilities. Zinc also plays an important role in wound healing. If you’re looking to include probiotics in your daily diet, you might want to try kefir. A cultured, fermented drink that tastes a bit tangy, kefir packs some serious immune-boosting properties in one simple drink. But what’s so great about probiotics? According to Routhenstein, probiotics protect the digestive tract, decreasing the chance of bacteria in the intestines entering the bloodstream. This helps lower infection rates and supports the health of the immune system. Plus, a 2012 study by the University of Medicine and Dentistry of New Jersey also showed that probiotics, specifically Lactobacillus, reduces the common cold by two days and decreases the severity of the symptoms. If you’re looking for a nutritious salad topper or snack to eat in the car, sunflower seeds might be just what the nutritionist ordered. Sunflower seeds are packed full of vitamin E, which helps boost your immunity. “Vitamin E is a potent antioxidant and a positive immune system stimulator,” Routhenstein says. Also, research has shown that people who have adequate levels of vitamin E had fewer colds, flu and sicknesses, Dr. Bruce Bistrian, chief of clinical nutrition at Harvard-affiliated Beth Israel Deaconess Medical Center, told Harvard Health Publishing. This tropical fruit is packed full of vitamin C, vitamin A, lycopene, fiber and vitamin K.
“It has 350 percent more vitamin C than an orange and the whole fruit is used medicinally,” Lisa Hayim, a registered dietitian and founder of The Well Necessities, tells SheKnows. Not only is yogurt convenient and delicious, but it also helps protect your immune system. Since yogurt is a great source of probiotics, it often tops the list of immune-boosting foods. In fact, Lauren Manaker, a registered dietitian, tells SheKnows that she recommends her clients eat foods that contain probiotics to help boost their immune system. She explains that some strains like Bifidobacterium lactis have been clinically shown to be effective bacteria to enhance some aspects of immunity if it is taken at an appropriate dose consistently. You can enjoy ginger fresh, in juice or as a spice. This fragrant root is commonly used in cooking, but it also eases queasy stomachs and boosts your immune system. “Ginger is a nutrient-dense root that cleanses the lymphatic system and treats inflammation,” says Hayim. These things are all important when our immune system is bogged down by sickness or environmental causes. When it comes to boosting immunity, we talk a lot about probiotics, but we also need to fill our diets with prebiotic foods. “Asparagus is a prebiotic, which is essentially the food needed for probiotics (the good bacteria) in the gut to survive,” says Routhenstein. By consuming prebiotics, it will also increase the population of the beneficial microbes (i.e., probiotics), which indirectly has a beneficial effect on the immune system. This vibrant-colored fruit is jam-packed full of antioxidants, which help protect healthy cells from damage caused by free radicals. Hayim recommends adding elderberries to your diet because they fight recurrent infections and prevent the common cold. Lentils are easy to cook and come in variety of colors, including orange, green and black. But that’s not what makes this legume so popular. Routhenstein says lentils are packed with zinc, which is a mineral required for creating T-cells, a kind of white blood cell that helps fight infection. So, the next time you’re out grocery shopping, you may want to throw a few of these foods in your cart — they’re not only delicious, but could help keep you healthy too.